Bunjob graduated from the Boromarajonani College of Nursing in Lampang. Specialist in GI Nursing, Bunjob also has 4 years experience working at Nakornping Hospital. 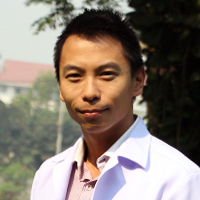 He also work in the Out Patient Department and Primary Care Unit at Changpuek Hospital. He has experience practicing rehabilitation and emergency resuscitation of patients.